Now this is freaking cool as all get out. A small 250cc Cafe Racer from Cleveland Cyclewerks, called the Misfit. $3195.00 brand new, and it gets 65MPG+. I really dig this bike. Retro Cafe is just cool. Not all bikes have to look like Fat Boys, Dirt Bikes or Rocket Ships. Decent looking, but I think that I would want something a bit bigger than a 250 toplay with. If I am buying a commuter, then I want more wind protection. 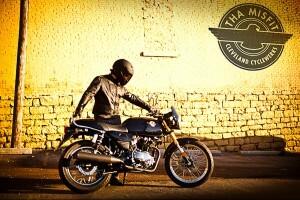 One day I will probably buy and old cb750 and make a cafe. I was going to with my current bike, but just too many gizmos and wires to hide. Yeah, I see what your saying… but that’s not what this bike is about. It’s not just playing at Retro, but it’s a genuine throwback to a simpler time with a simple bike, with about as little maintenance as you can get with a motorcycle. And 250’s can be a lot of fun. I’d love to have this machine in the garage to play with on Saturday Mornings… because it would be more fun than a cartoon. For those CB750’s there are tones of Bobbers and Cafes on KSL.com and if that’s not good enough- you can actually buy Cafe Kits to turn yours into a Cafe Racer. THAT also sounds like a lot of fun. And yes, I have thought about a Ninja 250R. I wish that this had been out when I bought my bike. It has a “trunk” where the gas tank goes and is supposed to get 70mpg. It is a 670 paralell twin. Yeah, they are cool. And cheaper than a BMW. I lust for the above. I know that this is a historical style excersize, but for ~$20k I want more power than it has. Afterall the original cafe racers were all about taking a stock bike, adding whatever power you can, and taking whatever weight off you can. Then race to a point and back before the song was over, right! Oh yeah, a Norton. Those are fantastic. I like these. Back in the day I used to ride a Yamaha RD 350 so I can relate to pocket rockets. BTW – congrats on your new ride, George. Not a big deal, but a bunch of people’s old links just broke. I think that’s a DNS issue… Should clear up. My buddy sells these at http://www.scramblercycle.com. Cleveland also makes a bobber called The Heist. They have plans to bring out a motard bike called the Hooligan, and a scrambler called the Ace. He has two Misfits in stock right now. They are pretty cool. I have sat on one, but never ridden one. They are surprisingly tall. I am 5’11” and weigh 200 lbs. I did not feel like the bike was too small for me. Had a ’67 Duc 350 that Syd Tunstall rebuilt for me as a cafe. He set it up like the one he raced only not quite so radical on the engie Only thing on it that was metal was the frame and the engine. Scarey fast(took it to 135 once), but fun as all get out to ride. Longest trip I ever did was Tampa to Savanah. Couldn’t take it overseas with me so I gave it back to him. Had a ’67 or ’68 Suzuki 200cc Scrambler (Twin 2-stroke) in the mid 70’s. Oh, the styling, the smell, the vibrations. Those chrome half height pipes, the two-tone burgundy/silver paint job on the tank with black rubber knee pads, the integrated speedo/tach/light housing. Nevermind the tempermental points and unreliable wet weather ride. My coolest ride ever. Or if you can find one, you could pick up a used Honda GB500 for less with a known motor(instead of a Honda knockoff Lifan). Still not a big bike, but the same styling and definitely a bit more get up and go. $3,200 for a bike that cool?!?! I want that bike. And I don’t even want a bike but I want that bike. I hate you George. Now I’m going to start saving for one. This will be my first bike. Maybe my only bike. Damn. If you are only going to have one… Make it a Bitchen one. Cool, this looks like the bikes I grew up with! When I was younger I LUSTED for a Honda GB500. I LOVE the old Cafe Racers. The ooze attitude… style… and sometimes oil.